Eating too much salt is bad for the health, especially to people with hypertension, diabetes, and obesity since it worsens their condition. There are approximately 36 million adults with high blood pressure (also called hypertension) in the United States alone. It is necessary that we keep track of our daily consumption of salt but it is hard to do so. People tend to enjoy eating so much that they don’t take time to think about the amount of salt they consume. The good news is that a newly developed biomedical device can help us with this problem. Researchers at the Georgia Institute of Technology have created a salt sensor that fits in the roof of your mouth with an oral retainer and uses Bluetooth to send salt intake data to a smartphone app. The device is made up of new wireless stretchable circuits mounted to a porous membrane that can measure how much sodium a person does eat in real time. Its power source is a rechargeable micro-coin battery (measuring 6.8 mm in diameter), which can continuously monitor real-time sodium intake for 12 hours. 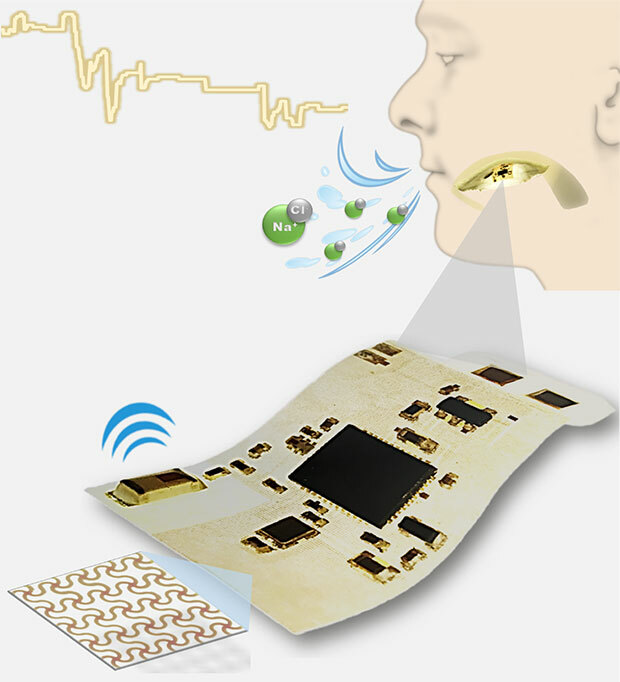 W. Hong Yeo, an assistant professor of micro and nano engineering who led the research team said that it is possible to stick the sensor directly to the tongue or the roof of the mouth, or to laminate it onto a tooth. “For the first prototype device, we wanted to offer easy handling and cleaning capability via the integration with a soft retainer,” he said. The team has already developed an android app companion to the device that uses Bluetooth to send data to smartphones or tablets. The purpose of this application is not just about keeping track of the sodium intake of a user. It can also be used as a basis on planning their meals and be able to manage it better. The team continuously makes improvement on the design, making it smaller for comfortable use. The researchers claims that the device is almost ready for implementation and be sold in the public soon. However, they say that it still depends on whether the medical device companies will be interested enough for it to be commercialized.